Born in Riversdale in the southern Cape, Dalene Matthee studied music, and was a staunch conservationist, particularly regarding the reckless destruction of indigenous forests, with specific affection for the Knysna elephants, the “forest people” and the yellowwoods. She swapped the piano for the pen with no less than 13 literary works coming from it. The roots of her “forest novels” are deeply entrenched in the upbringing of Afrikaans youth and South African literature. With Circles in a Forest reprinted 22 times, her works were translated into 14 languages and won numerous literary awards. She’s the only Afrikaans author who has sold more than one million books in SA. SANParks, Tafelberg publishers and Dalene’s children eternalised her legacy with a memorial at the foot of an almost 900-year-old yellowwood in the Knysna forest, the trees weeping for this prolific South African writer, like she once wept for them. (dalenematthee.co.za). According to her third daughter, Hilary, Dalene didn’t eat mushrooms, because she believed they were “fairy homes”, so we created meringue versions instead! Paying tribute to her novel, The Mulberry Forest, why not add mulberry jam? To make the chocolate log, preheat the oven to 200°C and line 2 large 35cm x 25cm standard baking trays with baking paper, then grease the baking paper. In a large, clean bowl, whisk the separated egg whites until thick and they reach stiff peak stage. Slowly whisk in a ¼ cupful of the 150g castor sugar until glossy. In another bowl, whisk the separated egg yolks and the remaining castor sugar until the mixture is very thick and pale, about 10 minutes. Fold in the vanilla extract and the sifted cocoa powder. Lightly whisk 1/3 of the whipped egg whites into the egg yolk mixture to lighten it. Fold in the remaining egg whites, taking care to knock as little air out as possible. Divide the cake batter between the lined baking trays and spread out evenly with a palette knife or offset spatula – use a light touch to avoid knocking out too much air. Bake one tray at a time on the centre rack of the preheated oven, 10 – 15 minutes or until springy to the touch. Allow to cool completely (the cake will sink a bit). For the meringue mushrooms, preheat the oven to 120˚C. Using an electric mixer, beat the 4 large egg whites until stiff peaks form. Gradually add the 225g castor sugar, a tablespoonful at a time, whisking after each addition, until the sugar has dissolved and the meringue is glossy. Once all of the castor sugar has been added, continue to beat on high, 3 minutes. Scoop the meringue mixture into a piping bag fitted with a large straight nozzle, then pipe the mushroom stems, either horizontally or vertically, on a prepared baking sheet. Pipe the roofs of the mushrooms separately on a prepared baking sheet and bake, 1 hour 30 minutes. Switch off the oven and leave the meringues in the oven to cool completely. To make the buttercream, place the 6 eggs and 400g castor sugar in a bowl that fits over one of your saucepans. Fill the bottom of the saucepan with water and bring to a gentle simmer. Place the bowl with the egg and sugar mixture over the hot water, and stir gently (don’t whisk and, thus, aerate the mixture; the bottom of the bowl should not touch the water below it). Keep stirring until the mixture reaches 60˚C on a sugar thermometer or until the eggs are hot to the touch. Transfer the hot mixture to the bowl of a stand mixer and using the whisk attachment, whip the mixture on high until light and fluffy. Continue whipping, 10 minutes or until the mixture is thick and cool to the touch. Slowly add the butter, one cube at a time, while whisking. Cover and set aside at room temperature, until ready to ice the cake. For the chocolate bark, melt the chocolate and spread it evenly over a sheet of baking paper, leaving a 2cm border all around to avoid the chocolate oozing out on the sides. Place another sheet of baking paper over the chocolate to cover it. Roll up into a tube and tie with kitchen string. Allow to set in the fridge, 5 – 10 minutes. Once set, unroll and allow the chocolate to break. To assemble, cut each sheet of cake in half lengthways so you have four long strips (if the cake is sticky, don’t remove the baking paper from the strips of cake). Starting with one strip of sponge (the short side closest to you), spread the jam as a base, followed by the buttercream, evenly over the cake, leaving a border at the end furthest from you. Repeat the process with the remaining 3 cake layers, spreading them with jam, followed by the buttercream, then lay them end-to-end to form one long strip of cake. Starting from one side, roll the cake up (using the baking paper to help you and peeling off the paper as you go) to form a short, fat roll. Trim off the ends, if desired, then place the cake on a serving plate, with one of the flat sides as a base. Add the50g cocoa powder to the remaining buttercream and ice the top and sides of the cake. 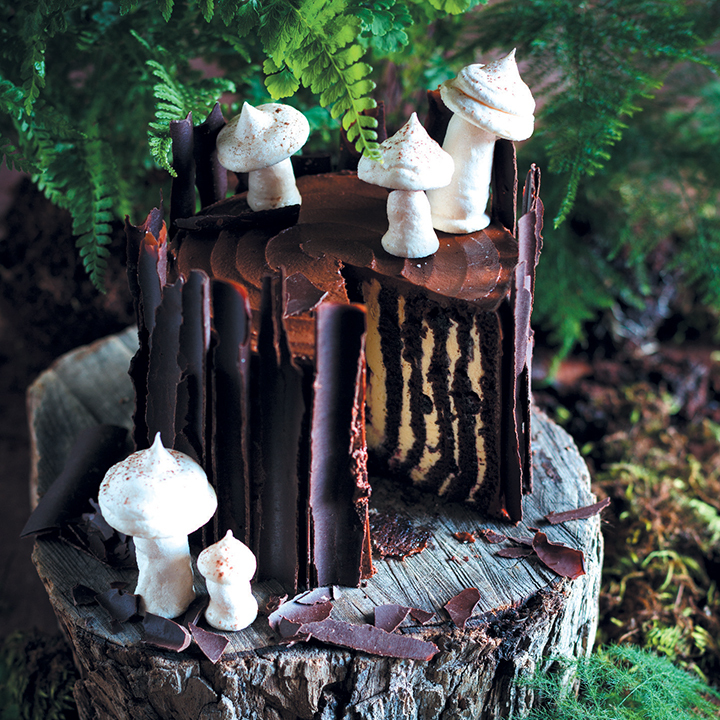 Stick shards of chocolate around the cake to form the bark of the log and top with the meringue mushrooms to decorate.